OK, so here’s an inspired idea, the kind of thing devised by idiots who’ve been drinking all weekend. So this weekend. My college friends and I were gathered for our annual Fall session of telling stories like none of us had ever heard them before and being demonstratively juvenile. 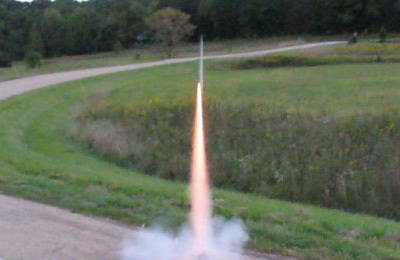 We discovered that the house we were staying in contained a model rocket and loads of propellant. Of course we had to shoot it off. I had not done this since I was little. I was soon reminded that the key to the whole thing (or rather the key to doing it more than once) is the secondary charge that goes off to spring the nose cone and deploy the parachute which floats the whole fuselage* back to Earth. We were doing in this in the middle of a prairie. It wasn’t exactly parched, but I’m not sure Smokey the Bear (or NASA or the FAA) would have approved. As soon as the first one went up a small group of the inebriated ran out into the field, matching — or attempting to match — the trajectory of the descent with their own jagged strides. Just like 500, you see. But the problem was that it was dusk and the rocket went way the hell up. At it’s apogee (yay, SAT!) it was lost from human eyesight. Only a few hundred yards up did it become visible and usually it was hurtling down with a half-opened, if not outright flaming, parachute. Dangerous as all hell. If you’re not pegged in the face with a rocket strut you’re scalded by the hot cylinder itself. It was pure comedy. Try it sometime and remember where the game was invented, right here on Ascent Stage. For added difficulty play in an urban area with lots of obstacles. [*] A descent stage, you might say. But you would be wrong. A descent stage is a powered rocket whose purpose is to counteract gravity during a descent (as in to the moon). But that’s a great idea. Where are the model rockets with descent stages! ?